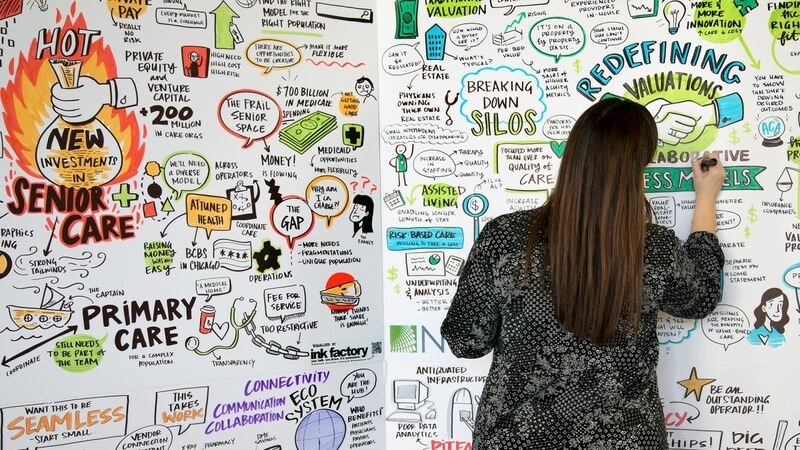 At Ink Factory, we see the power that visual notes can have to energize a room every day. Visual note-taking (also called graphic recording) involves capturing ideas in real-time using simple words and pictures that act as metaphors for complex ideas. Because visual notes align with how we learn best – visually – they are a proven tool for helping people remember and easily connect ideas and concepts shared in settings like meetings, conferences, keynote sessions, and brainstorms. Drawing fights boredom and sparks inspiration – that’s why so many of our clients are conferences looking for new ways to engage their attendees. 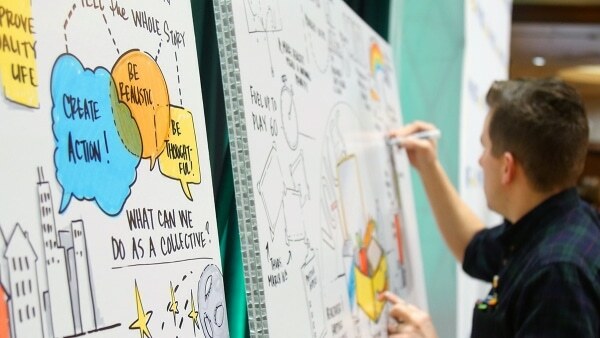 Here are five conferences that understand the power of visual note-taking and are using it to it’s fullest potential. NIC is tackling a big challenge: coordinating resources to meet the growing need for senior housing and care. There’s a lot to talk about, so we help them keep track of it all by documenting their bi-annual conference where investors, tech entrepreneurs, care operators, and building managers come together to discuss the most important needs in senior care. We take visual notes of all their general sessions, plus numerous breakout talks. By the end of the conference, a huge wall of visual notes from each session is on display for attendees to review, meet, and discuss. It’s the perfect way to keep important conversations going. 2. Nourish To Flourish Conference – Dairy Management Inc. When there is a good cause behind our client’s initiatives, we take note (literally)! The Dairy Management, Inc. and the National Dairy Council brought together a large group of individuals to brainstorm how to improve school lunches across the United States. From students to teachers, farmers to consultants, the brainpower in the room was incredible. Over the three days, the group talked about the current and future state of our school lunch program. They brainstormed on what the future looks like in a perfect world, thought through scenarios that are attainable, and then created an action plan to keep the momentum going. Our visual notes were a vital tool in aligning the conversations, capturing important ideas, and visualizing the action plan from each group. HR is a big deal – and a HUGE industry. The HR Technology Conference & Exposition is working to meet their needs with cutting edge tech. It’s the world’s largest expo of HR technology products. Our client, Maestro Health, partnered with HR Tech to bring digital visual note-taking to the conference’s general sessions. As the speakers and panel discussions occurred, an Ink Factory artist was drawing using our large-scale digital tablet. On the trade show floor, we created an illuminated booth covered in drawings that illustrated customer reactions to the Maestro Health offering suite. We had artists stationed at the booth, visualizing valuable feedback from Maestro Health’s potential consumers. By the end of the three-day event, our artists had covered over 250 square feet in visual notes. Chicago Ideas is a movement built on one core belief: when a broad spectrum of thinkers and instigators share ideas, we have the power to transform our world. Chicago Ideas brings together some of the world’s most outstanding speakers to present their ideas and inspire the innovations of tomorrow at 80+ sessions across the city of Chicago. Each year we create visual notes of every single talk and conversation at Chicago Ideas. Talks from 60-90 minutes include topics like entrepreneurship, political issues, health, and innovation. We draw live during each conversation, and then bring the finished visual notes down to the lobby for participants to photograph and view after the talk. Chicago Ideas knows that when everyone in the room is focused, the power of group genius is unleashed. People are drawn to our visuals, which make them a perfect place for different ideas to come together. We helped internet retailer software platform Guidance better explain their product offerings at the Internet Retailer Conference + Exhibition – an event filled with the latest and greatest solution providers in e-commerce. Guidance clients range from name brand retailers and consumer product manufacturers to publishers, service providers and charitable organizations. Guidance provided various client case studies, showing how their product improved performance and ROI. An Ink Factory artist was stationed at their booth for the entire conference, illustrating these case studies in front of participants. Any industry can benefit from visual note-taking. That’s because it’s not about industry-specific jargon. We capture your big ideas and create visuals that get to the core of your conversation, so you can focus on moving forward and achieving your goals. Interested in having us a your next conference, trade show or meeting? Contact us today.